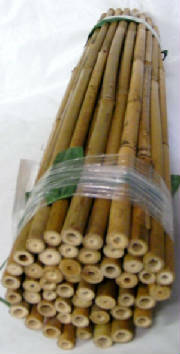 We offer two types - Treated Pine and Bamboo. Don't buy more stake than you need! For 90% of planting applications the stakes needed for our protectors are the same size as the protector, except for the 24" units and shorter. TREATED PINE STAKES lengths are 36", 48", and 60". The dimensions are 3/4" x 1". They are clear, straight, kiln dried and pencil pointed. Don't buy more stake than you need! For 90% of planting applications the stakes needed for our protectors are the same size as the protector, except for the 24" units and shorter.